Europe Flatly Rejects GMOs On Their Soil. Now, Africans Too Reject Gates/Mosanto GMOs In Africa. On March 23rd 2015, the Bill and Melinda Gates Foundation (BMGF) and the United States Agency for International Development (USAID) convened a secret meeting to promote a recent report detailing in clear terms how to privatize the seed and agricultural markets of Africa. The meeting was criticized for including corporations, development bodies, trade bodies and aid donors, yet excluding any African farmers or representatives of affected organisations. 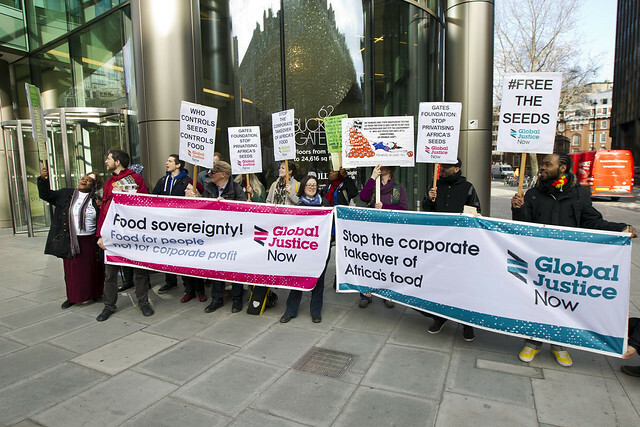 In response, food justice campaigners held a demonstration outside the offices of the BMGF in London, with placards calling on the foundation to ‘free the seeds’ and handing out packets of open-pollinated seeds as a symbol of the alternative to the corporate model promoted by USAID and BMGF. A papier mâché piñata representing the commercial control of seed systems was smashed by the protesters, with thousands of seeds inside being spilled over the steps of the entrance to the BMGF. A twitter-storm also took place aimed at the Gates Foundation using the #freetheseeds hashtag. The London meeting discussed a study produced by Monitor-Deloitte which was commissioned by the Gates Foundation and USAID. BMGF is a major sponsor of the commercialisation of agriculture in Africa including through its subsidiary the Alliance for a Green Revolution in Africa (AGRA). Critics have argued that this commercial agenda extends foreign policy into Africa on behalf of corporate interests, threatening the livelihoods of millions of small-scale farmers who rely on recycling seed for their livelihoods. Although historically, in Africa and around the world, farmers have been the traditional developers and distributors of improved seeds, the study does not consider a potential role for farmers in the production or distribution of seed. Instead, farmers are viewed only as passive consumers of seed produced elsewhere. "Seeds are vital for our food system and our small farmers have always been able to save and swap seeds freely. Now our seed systems are increasingly under threat by corporations who are looking to take more control over seeds in their pursuit of profit. This meeting will push this corporate agenda to hand more control away from our small farmers and into the hands of big seed companies."